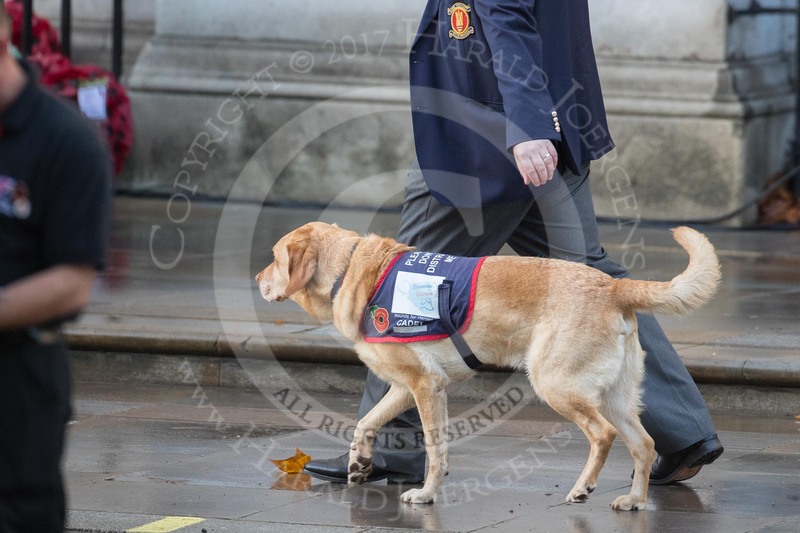 A "Hounds for Heroes Cadet" marching past the Foreign and Commonwealth Office with his handler before the Remembrance Sunday Cenotaph Ceremony 2018 at Horse Guards Parade, Westminster, London, 11 November 2018, 08:48. 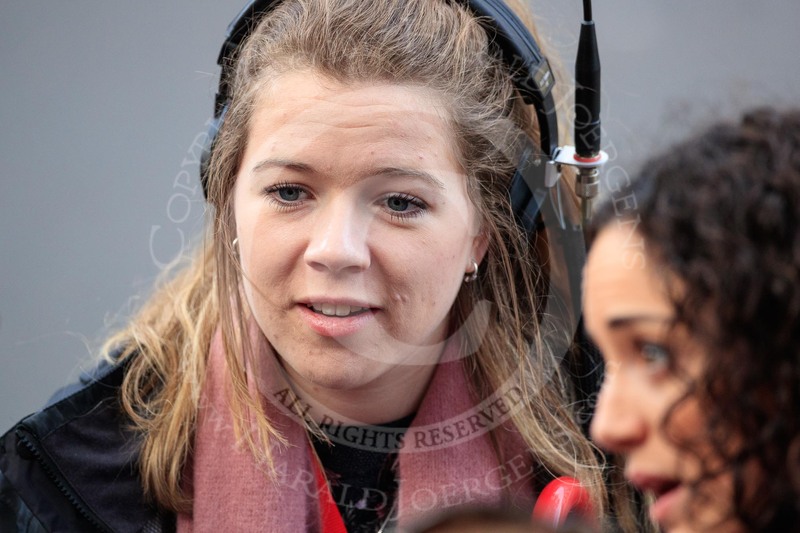 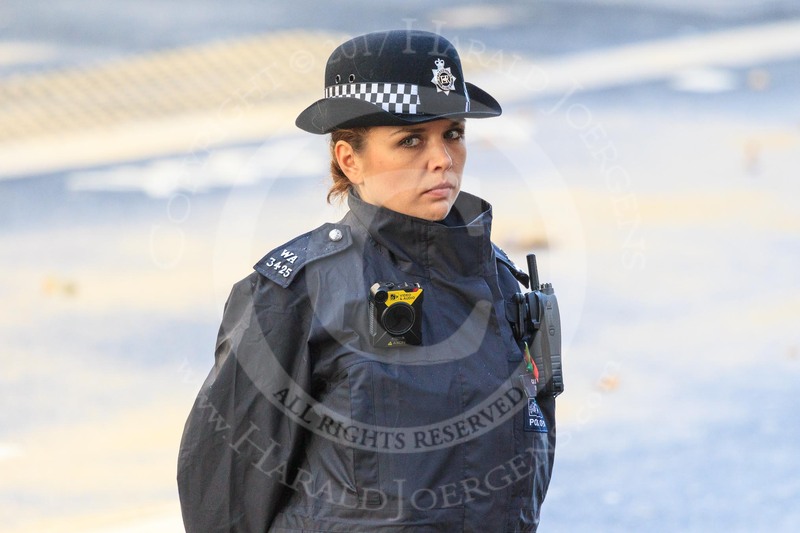 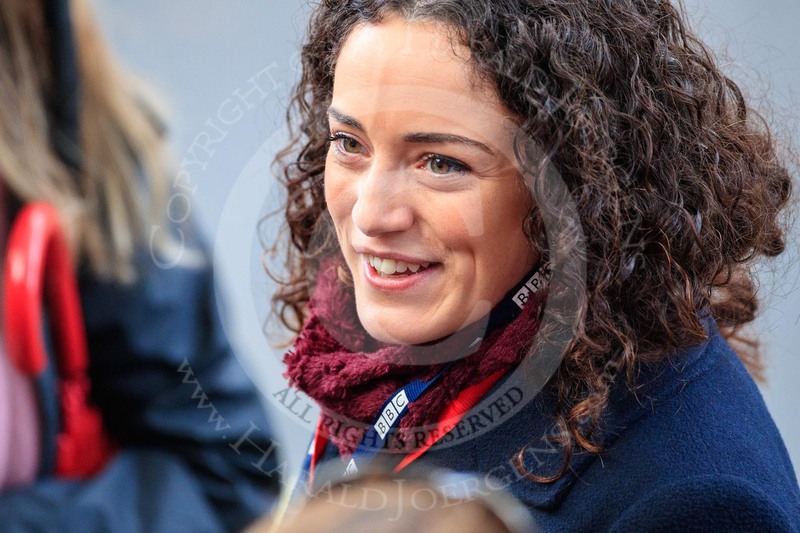 A female Metropolitan Police Constable keeping an eye on the crowds during Remembrance Sunday Cenotaph Ceremony 2018 at Horse Guards Parade, Westminster, London, 11 November 2018, 08:51. 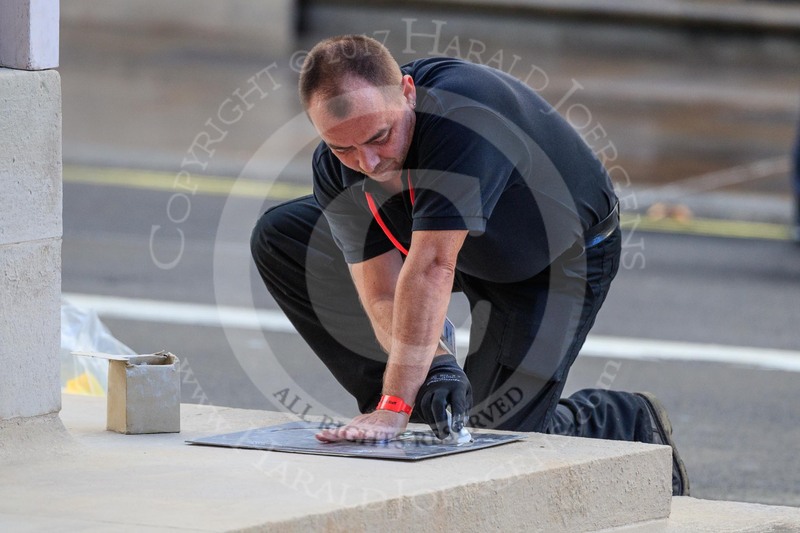 An Foreign and Commonwealth Office workman marking the position where the wreaths are to be laid around the Cenotaph before the Remembrance Sunday Cenotaph Ceremony 2018 at Horse Guards Parade, Westminster, London, 11 November 2018, 08:52. 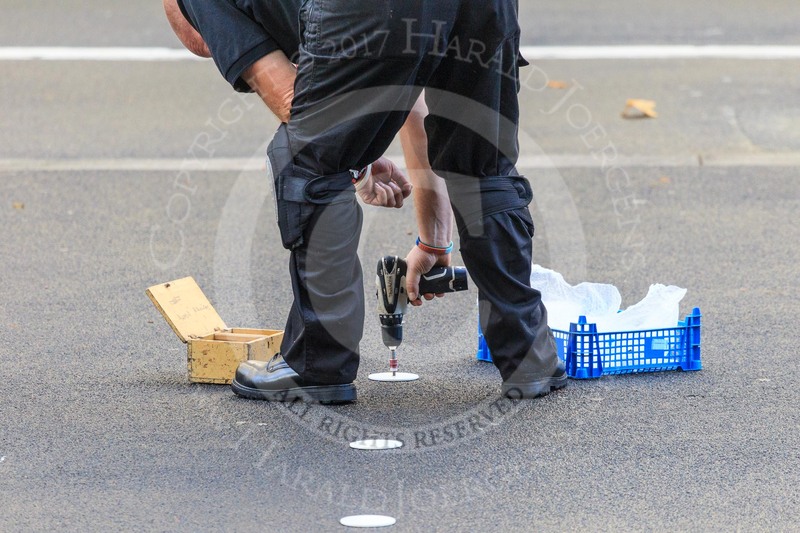 An Foreign and Commonwealth Office workman is screwing white discs onto the tarmac at Whitehall to mark the position of the members of the Royal Family and their Equerries before the Remembrance Sunday Cenotaph Ceremony 2018 at Horse Guards Parade, Westminster, London, 11 November 2018, 08:54. 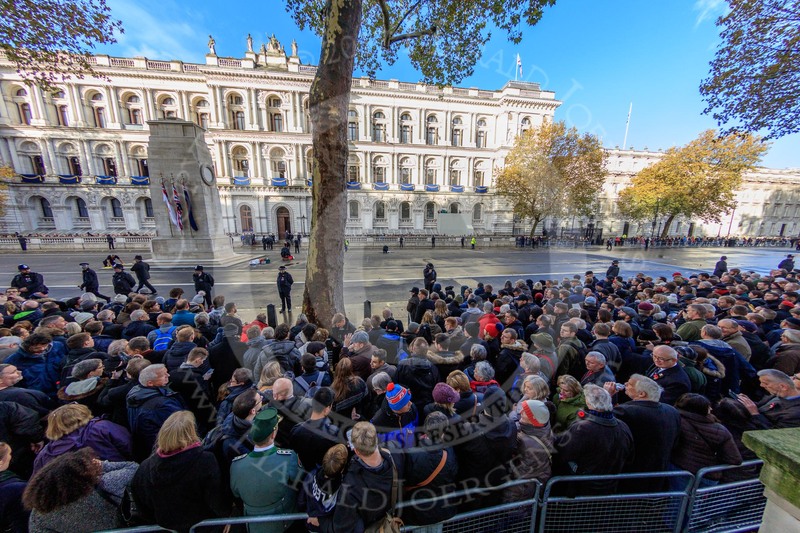 Fish eye view from the press stand on Whitehall opposite the Foreign and Commonwealth Office before Remembrance Sunday Cenotaph Ceremony 2018 at Horse Guards Parade, Westminster, London, 11 November 2018, 08:56. 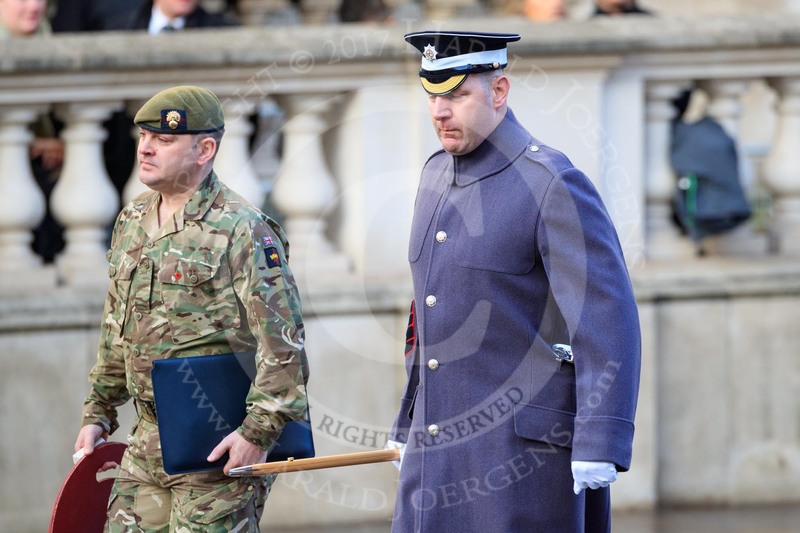 Garrison Sergeant Major (GSM) Headquarters London District, Warrant Officer Class 1 Andrew (Vern) Stokes before the Remembrance Sunday Cenotaph Ceremony 2018 at Horse Guards Parade, Westminster, London, 11 November 2018, 09:01. 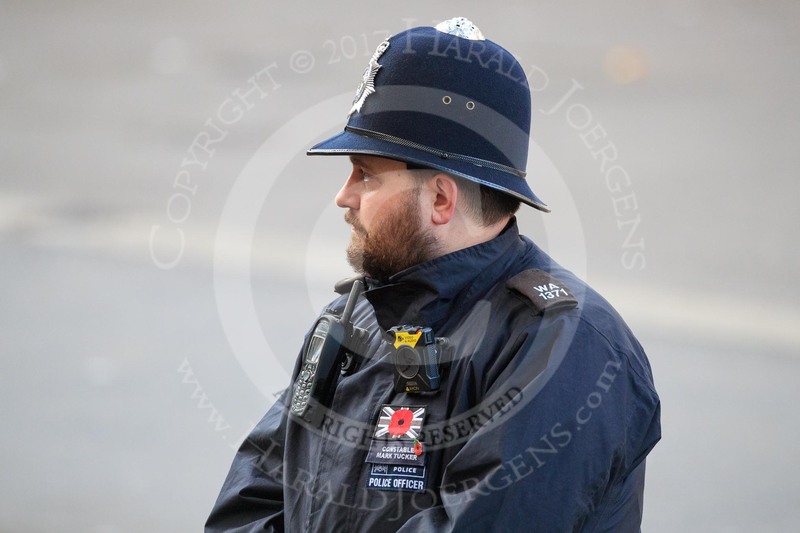 Metropolitan Police Constable Mark Tucker keeping an eye on the spectators before the Remembrance Sunday Cenotaph Ceremony 2018 at Horse Guards Parade, Westminster, London, 11 November 2018, 09:04.
during Remembrance Sunday Cenotaph Ceremony 2018 at Horse Guards Parade, Westminster, London, 11 November 2018, 09:10. 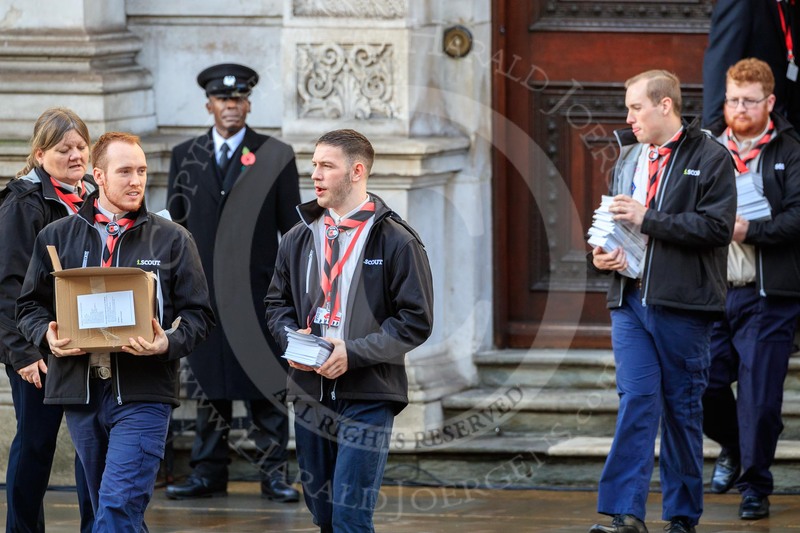 The The Queen's Scouts leaving the Foreign and Commonwealth Office to distribute the Order of Service in Whitehall before Remembrance Sunday Cenotaph Ceremony 2018 at Horse Guards Parade, Westminster, London, 11 November 2018, 09:13. 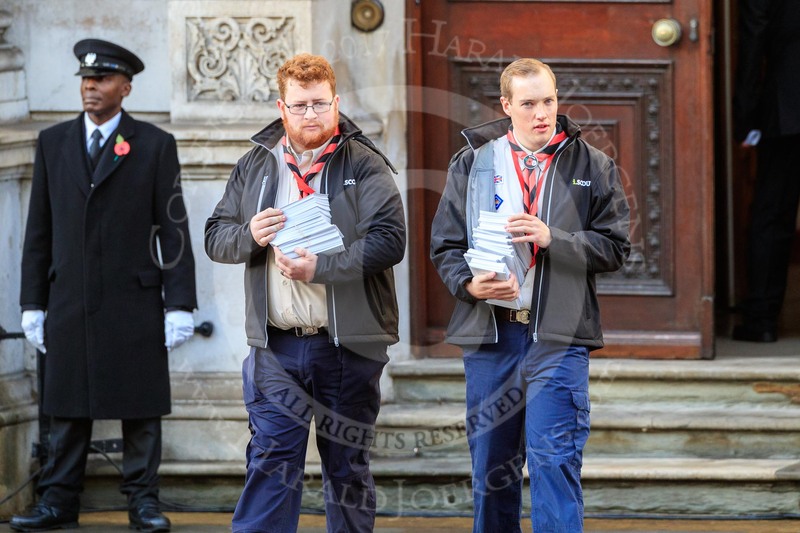 The The Queen's Scouts leaving the Foreign and Commonwealth Office to distribute the Order of Service in Whitehall before the Remembrance Sunday Cenotaph Ceremony 2018 at Horse Guards Parade, Westminster, London, 11 November 2018, 09:13. 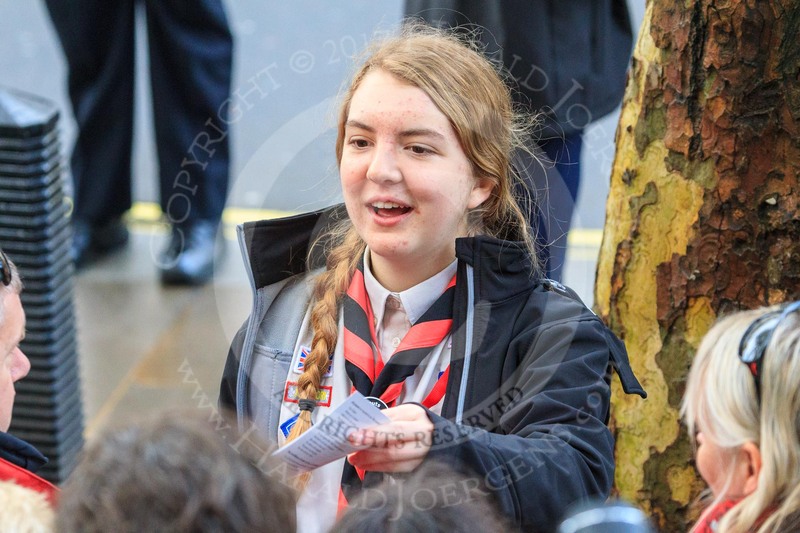 The The Queen's Scouts leaving the Foreign and Commonwealth Office to distribute the Order of Service in Whitehall before the Remembrance Sunday Cenotaph Ceremony 2018 at Horse Guards Parade, Westminster, London, 11 November 2018, 09:24. 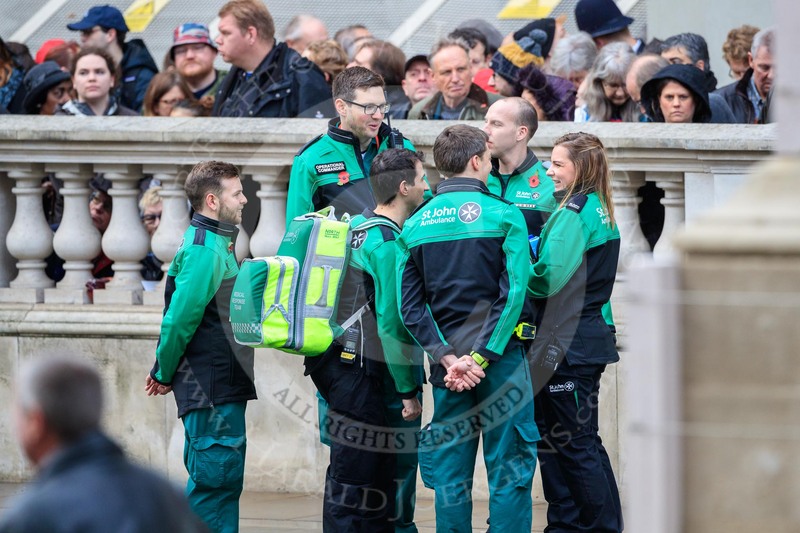 St John Ambulance staff gather on Whitehall before the Remembrance Sunday Cenotaph Ceremony 2018 at Horse Guards Parade, Westminster, London, 11 November 2018, 09:26. 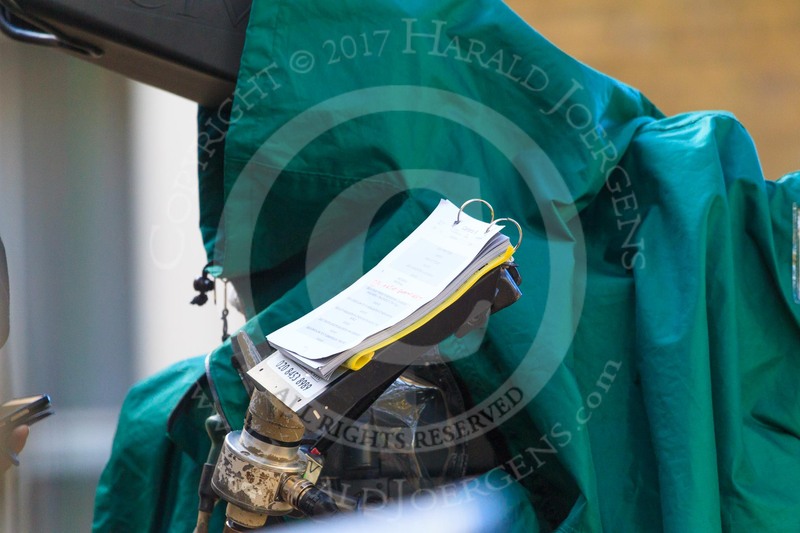 The to-do list for the BBC's camera 6 on Whitehall before the Remembrance Sunday Cenotaph Ceremony 2018 at Horse Guards Parade, Westminster, London, 11 November 2018, 09:32. 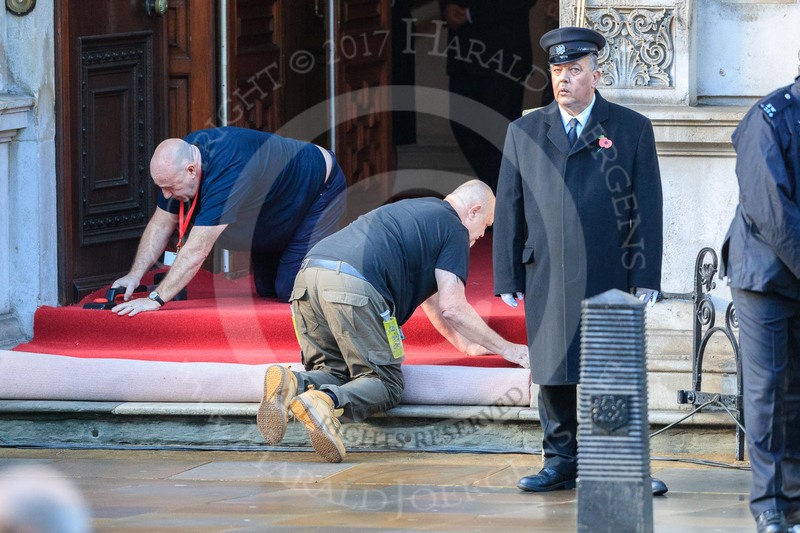 Rge red carpet is rolled out at the entrance of the Foreign and Commonwealth Office before the Remembrance Sunday Cenotaph Ceremony 2018 at Horse Guards Parade, Westminster, London, 11 November 2018, 09:40.